Underdog is responsible for the design and assembly of a Comfort Creations product catalogue CD, which is given to their clients in order to showcase their products in the comfort of the clients’ homes. The CD was designed in FLASH and features an extensive range of products with an option to download CAD files for each product allowing an interior designer to include these products in designs for their clients. The CD also provides printable pages for easy reference and woks on PC and Mac. 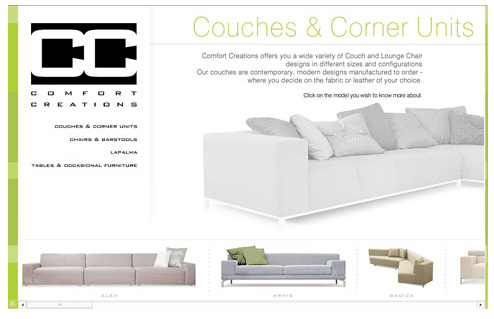 Underdog has also designed, built and currently maintains Comfort Creation's website.